A crunchy, tangy and sweet side dish that is a perfect side dish for hot weather. Enjoy! In a medium saucepan over high heat, bring the vinegar, sugar, celery seeds, vegetable oil and 1 teaspoon salt to a boil, then remove the pan from the heat and allow to cool, about 20 minutes. 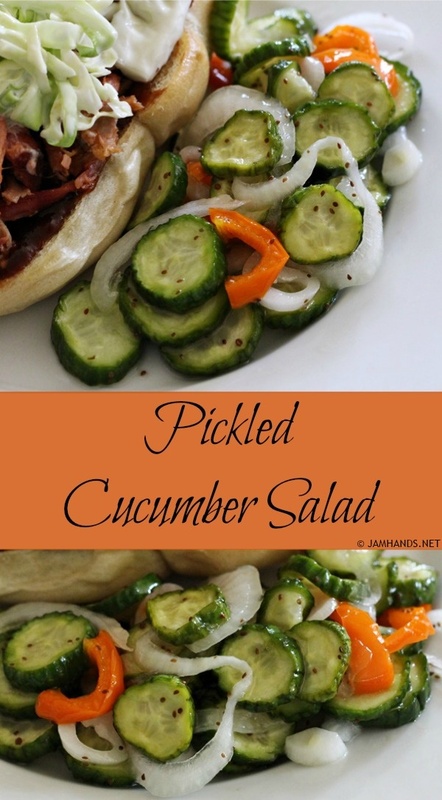 In a large bowl, toss the sliced cucumbers, onion and bell pepper with the liquid mixture and refrigerate overnight. Serve cold. Recipe from Food Network Magazine and Trisha Yearwood. I'm intrigued! This sounds unique and delicious. Definitely trying soon! Yum! I have never put peppers in my cucumbers, but that sounds lovely! I make these refrigerated pickles every summer-love, love them. Looks delicious! Great summer side.